With more than $20B worth of M&A deals in the year 2015, the hype term “Internet of Things” (IoT) has started to establish itself as a tech sector on its own. Is it worth investing a significant portion of my portfolio into IoT stocks? Which companies will be shaping the IoT world in the coming years and will therefore overperform the market? You have missed out on a couple of 30%+ performances in 2015. Some early IoT stocks have started to take off. The January/February 2016 tech sell-off has cut technology company valuations (and also those of IoT companies) by up to 50% – Some valuations appear very attractive. 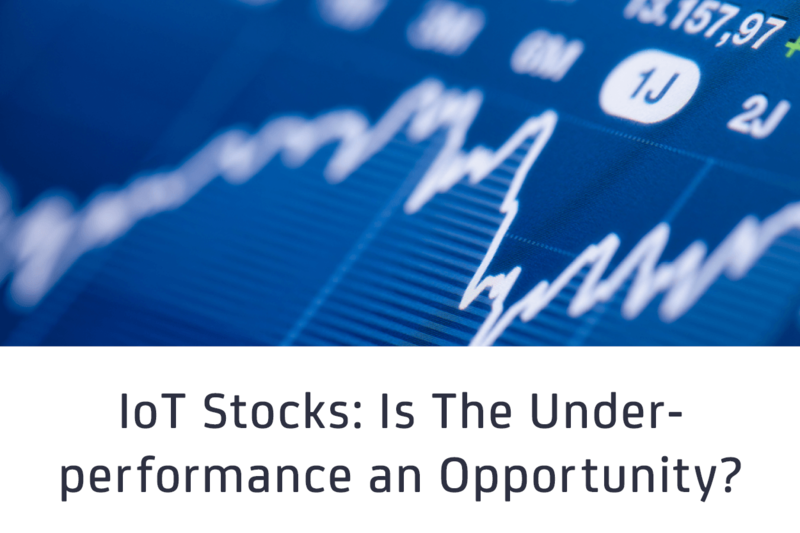 If you believe IoT stocks have the potential to beat the market, it is not too late to invest. IoT stocks have actually been underperforming the market in the observation period. In the timeframe from 13 February 2015 to 10 February 2016, the NASDAQ fell by 12% while our equally-weighted watchlist of 32 IoT Companies fell by 16% (see below for a description). You may also want to check out our corresponding blog post from late 2014, labelled 15 Internet of Things stocks you should own right now. An interesting observation is that large cap IoT stocks have outperformed small cap IoT stocks in 2015. Small cap IoT stocks underperformed the NASDAQ index by roughly 6 percentage points while large cap IoT Companies outperformed the NASDAQ by 3 percentage points. It is important to note that there is basically no “pure-play” large cap IoT company but certainly a number of “pure play” smaller ones. In that sense Internet of Things stocks may have underperformed the market in the observation period even more than the watchlist suggests. A couple of Internet of Things stocks really stand out. Among the “non-pure play” large companies Amazon Inc. rose 30%. The company made a significant step into IoT in 2015 with its AWS IoT announcement. Google which announced Brillo, Weave, and Thread IoT initatives during the 2015 period also rose 30%. Luxoft, a multinational software company and a system integrator for IoT, is currently 25% above its share price at the start of the observation period. The IoT stocks of Lifelogger Technologies Corp., which produces a wearable camera and corresponding software tools as well as Novatel Wireless Inc., which provides wireless broadband access solutions for the Internet of Things both fell more than 80%. Sierra Wireless, a company offering connectivity solutions for the IoT, is currently -68% below the value it had a year ago. Software-focused IoT stocks did surprisingly well. This segment of the Internet of Things portfolio outperformed the NASDAQ by 8 percentage points and other IoT stocks by 11 percentage points. Besides the already mentioned companies (Amazon, Google, Luxoft), the software-focused IoT winners were Microsoft (+15%) and Software AG (+25%). Microsoft is growing its Azure IoT cloud offering and recently announced the new “IoT hub”, Software AG focuses on streaming analytics for IoT. IoT Hardware firms and specifically semiconductor companies underperformed the NASDAQ in the timeframe. The decline was driven by companies like Echelon and Invensense which both fell by more than 50%. Echelon markets an open-standard control networking platform, mainly for industrial applications. Invensense is best known for its sensors. Connectivity-focused IoT Companies also underperformed the NASDAQ by more than 10 percentage points. Most of the IoT Connectivity Stocks that we monitored underperformed and lost in value. Sierra Wireless lost more than 70% of its value during 2015. Gemalto, Gemtek Technology and CalAmp Corp. all lost more at least 10% of their value as well. Looking ahead: Has the time to invest finally come? Companies that are focusing their efforts on the Internet of Things are not beating the market on average. But with Internet of Things product revenues expected to reach billions of dollars and outgrowing most other technology segments in the coming years, the stocks would have to follow as well eventually. As can be seen in the analysis above, the market is seeing quite some volatility with individual IoT stocks rising or falling by up to 80% in one year. Software is generally outperforming the rest of the technology stack. We believe that IoT is here to stay and change products, people and society. A balanced portfolio of Internet of Things stocks might be a great alternative to the investment in individual stocks. One such portfolio is the “MEGATRENDS: IoT & Industry 4.0” which can be traded via the Stuttgart Stock exchange ISIN: DE000LS9GAC8. On a USD-basis the portfolio outperformed the NASDAQ by 1 percentage point in the observation period. The intent in publishing this article is to inform investors about developments related to specific Internet of Things stocks. The author did not and does not intend to suggest any specific action by any investor or shareholder and strongly suggest that any decision made to buy or sell shares of these stocks be made after consultation with an investment advisor as to the suitability of such an investment. The author currently does not own shares of any of the above-mentioned stocks but may buy or sell shares at any time based on market conditions and the trading prices. The author is involved in activities with the managers of the “Megatrends: IoT & Industry 4.0 portfolio” but does not own any shares of the same. This analysis is based on a portfolio comprising of 32 companies focusing fully or partially on the Internet of Things. The stocks were segmented by level of market capitalization and compared to the NASDAQ index. Christina Patsioura was a research analyst focusing on the topics of Industry 4.0 and Industrial IoT.